New Gracanica Monastery - On the day of Saint Nicholas, Saturday, December 19, 2009, His Grace Bishop Longin of New Gracanica-Midwestern America served a Hierarchical Divine Liturgy in the New Gracanica Monastery along with a number of Serbian and Russian clergy. On that day, the Bishop ordained Nikolaj Kostur into the rank of a deacon. Nikolaj is a graduate of the Holy Trinity Seminary and of Saint Vladimir's Seminary. After the Liturgy a festive lunch followed in honor of the Bishop's Slava and of Deacon Nikolaj's ordination. In January of 2000, Nikolaj enrolled in Holy Trinity Seminary in Jordanville, New York. 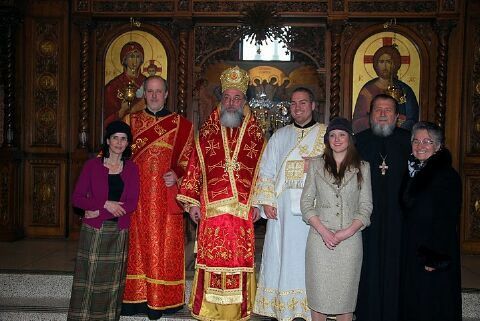 While studying, Nikolaj was able to spend much time with His Eminence Metropolitan Laurus of New York and Eastern America, First-Hierarch of the Russian Orthodox Church Abroad (now of blessed memory), developing an affinity for the Russian Church as a Sister Church of the Serbian Orthodox Church. On June 5, 2005, Nikolaj was tonsured a reader by His Eminence Metropolitan Laurus, with the blessing of his Diocesan Bishop, His Grace Bishop Longin of the Diocese of America and Canada of the New Gracanica Metropolitanate. On the same day, Nikolaj graduated from Holy Trinity Seminary with a Bachelor's Degree in Theology. In September of 2005, Nikolaj moved to Belgrade with the blessing of Bishop Longin in order to further his studies and more closely study the Serbian language for his future service to the Serbian Orthodox Church in North and South America. In August of 2007, Nikolaj enrolled in St. Vladimir's Orthodox Theological Seminary in Crestwood, New York. He completed his studies and graduated from St. Vladimir's on May 16, 2009, with a Master's Degree in Theology, having a concentration in Church History and Liturgics. During his studies, Nikolaj also worked in the Archives of the Orthodox Church in America, not only for research purposes, but also as the Assistant Archivist. On July 26, 2009, Nikolaj was married to Katherine Wolkow, daughter of Rev. Protodeacon Pavel and Anna Wolkow of St. Seraphim Russian Orthodox Church of Sea Cliff, New York, by His Grace, Bishop Longin of New Gracanica and Midwestern America. In September of 2009, Nikolaj was appointed Librarian of the Joe Buley Memorial Library at New Gracanica Monastery by Bishop Longin, and on the feast of St. Nicholas, December 19, 2009, His Grace, Bishop Longin of New Gracanica and Midwestern America ordained Nikolaj to the Holy Diaconate. Deacon Nikolaj will be serving in New Gracanica Monastery, as well as assisting His Grace Bishop Longin.